Many's the time I've turned left into Twelve Acres And A Mule Approach, glanced up to check the time on the KCC clock -- yep, 8:50am -- then wound / wended / whizzed my way past the library into the decoratively painted John Foxx underpass. Not once did I realise that I was within 50 of your metric meters of an undiscovered caff. Admittedly, it's the Brigadoon of tea rooms, manifesting only on certain days of the week. Such as today, Tuesday. 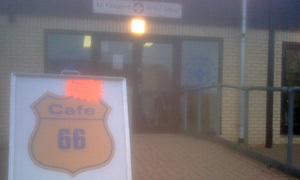 Tons of free parking thanks to avuncular Mr Tesco and the shortest of short-trousered strolls to Cafe 66. There's their US-style board, outside the scout hall, luring us in with a crimp and the promise of a reasonably priced bacon roll. You had us at "bacon". Being an offshoot of Poppy's Pantry, Cafe 66 is another USS Social Enterprise and thus "staffed by people with learning disabilities". Help yourself to a seat, study the straightforward menu of toasties, salads and sandwiches, tick a box on a little slip to make your selection and hand to waiter. Probably where Milsoms got the idea. Quick service and barely time to flick through today's Evening Star: lunch is served, a well-presented plate of tuna & mayo jacket with side salad. All good and a bargain price too. Not many places where a stranger will sit down at your table and enquire if you (or your relatives) have bare feet. Quite the most bizarre conversation I've had in a while. Tidy away these tables and this hall would be ideal for a quick knock, up to 11, best-of-5. Another day, perhaps. Meantime, a palatable mug of coffee in a Kesgrave 2000 mug and a wedge of flapjack: oats are good for you, after all. So, not the most obvious eatery in the area but well worth your support. If it was a car -- Volvo 66. If they were passing by -- Billy Connolly.